Porcelina's World: Dresses: It's the Peggy! 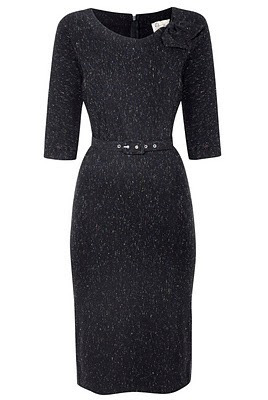 Thank you all so much for your opinions - taking them into account, I'm going to go for the Tara Starlet 'Peggy' dress. As some of you mentioned, I'll probably get the most wear out of it. So it's a practical decision, not just one from the dress-impulse part of my heart! Who else was jealous that Red Legs in Soho owns BOTH the dresses I was deliberating over?! In black, not the brown, which was an awful colour on me! They've sold out of the black online, but they had plenty in-store near me. The second dress doesn't appear to be available online. I'll have to take a picture, but it's a cap-sleeve short shift dress with tan and white dots on a black background. It's not what I would usually go for, but I think watching Mad Men has made me warm to early '60s fashion and it does look quite '60s on. Anyway, with the 20% off it was two dresses for £30, a bargain I think. I should get my order in now on Tara Starlet! I gave the casino dress to a local charity shop as it got a bit erm tight on me! Muhahahahahaha my work here is done!